Starbucks has a big brand presence online. Not because they have millions of dollars for Marketing and Advertising, which they do have, but because they are one of the most engaging companies online. If you are fan of Starbucks coffee, and a bit Internet savvy, then chances are you have come across one of if not all of Starbuck’s Social Media Pages. Starbucks has made it a point to take its successful offline branding strategies and implement them online. Its online image and messages have stayed consistent with their brand values, which are honesty, sincerity, and connecting with its consumers on a level unlike any other brand. The offline Starbucks Culture has taken to the airwaves of the Internet and Social Media. Lets take a look at how they became one of the most engaging brands online. 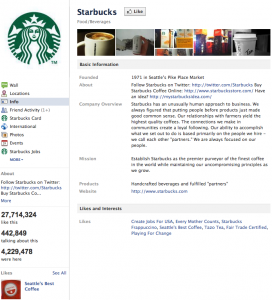 The Starbucks Facebook Page was created in 2008, with a total fan count of around 200,000. In the past 3 years, Starbucks has grown its “Facebook Fan” count to over 27,600,000 Fans! Making it number 33 on the All Facebook Stats Facebook Page Leader Board. This number is absolutely off the charts for a consumer brand product. In fact, Starbucks Facebook Page comes in at number 2 for all consumer brand products, according to All Facebook Stats. What is Starbucks’ Facebook Success Formula? Take a look at their profile and you will see for yourself. On the left side Starbucks has various tabs providing information that benefits the consumer more than Starbucks. Things like Locations for both International and nearby, sending, winning, and reloading Starbucks cards right from Facebook; Interactive consumer polls to get the best feedback possible and last but not lease a tab for employment opportunities for Starbucks locations worldwide. All of these tabs provide great information and don’t do a single bit of selling. If you take a look at the wall itself, you’ll notice there’s not a single post by Starbucks selling you anything. In fact if you look you will rarely even see a post by Starbucks. The majority of the posts on there are from their fans giving praise and sharing their experiences and love for Starbucks coffee. No Starbucks isn’t paying their fans to do this! They have simply created an online community, where fans and friends can come to share their comments, pictures, stories, and insider news to everyone who enjoys Starbucks. The Starbucks Twitter profile is not nearly as huge as it’s Facebook Page. With over 2 Million followers and counting, Starbucks Interacts with everyone on a daily basis. If you head over to their Twitter page, you will see an @ sign in front of every single tweet. Starbucks’ strategy is one where they would rather reach out and connect with each and every follower on a personal level; then spam their audience with advertising messages. A strategy that most brands don’t follow online. By upholding this standard, Starbucks has been able to create an online personality that people can connect to and therefore has been utterly successful with its online campaigns. Most businesses don’t want to spend the time reaching out and creating a real online personality. Instead they would rather just push out content to their consumers, this is meaningless and gets very little to no response. Companies need to take a look at how Starbucks, along with some other big name brands like Coke and Disney are building and engaging with their online communities. These brands have provided value to their fans rather than slapping advertisements on Twitter and hoping for the best. Social Media marketing will not work for you if you don’t take the time to provide real value. Engage with your fans on a daily basis. Social Media is all about building a following that wants to engage with you on a regular basis. If your social media efforts haven’t been working, take a look at these big brands and implement their practices into your own social media campaigns. Feel free to contact us about getting a personalized Social Media Plan for your business. Call us at 1-877-747-3263 or contact us through the online form in the top right corner! I can’t agree with this post at all. Not even a little. Every social media set up by them is abandoned for days at a time. They don’t engage or answer customers. It’s a lovely illusion only made worse by their shame of a site mystarbucksidea.com which is constantly left to trolls with no input whatsoever from admin. When they do show up they never actually interact with customers and give needed imput leaving false information up. I’ve never seen a company with so many resources do such a poor job. I really wish that was not the case. But it is. Now David’s Tea,there is a company that interacts with their customers, answering emails in a day and tweets and Facebook posts in minutes. Having a profile means nothing. Properly using it is everything. Agree to disagree Sadbuttrue. Not sure how you can say that Starbucks leaves their social media profiles barren for days on end and provides false information. Simply take a look at the posts Starbucks makes, and you will clearly see they post new valuable content on Facebook every single day, while also engaging with their followers on twitter multiple times a day. In fact, I was unable to see a single tweet sent out from them, that wasn’t in a response to one of their followers. On Facebook, Each post that Starbucks makes gets at least 100 shares, 10,000 plus likes in some cases and 100’s of comments. Would you like to see Starbucks respond to each and everything that someone has to say on Facebook? The fact of the matter is that, Starbucks fans do the talking for them. Each Fan on the page is a brand ambassador, willing and able to let everyone else know how much they enjoy Starbuck’s products. Many of the fans that they have, are actual employees of Starbucks branches. They are the ones that step in to help clear the air on any problems that arise and also provide valuable information got others There is no need for the official admin to get involved in every single comment made. When a serious customer service inquiry is brought up, you can clearly see that the Starbucks Customer Relations respond to them accordingly, directing them to the best possible place to swiftly get their issues resolved. You can see the proof by looking at Starbucks page recent activity. I took a look at David’s Tea Twitter account, I like that they do answer every tweet that comes in, ill give you that but they also only have 12,000 followers. A number much more manageable then over 2 million. This just shows me that they have a team of people sitting online all day waiting for that next tweet to pop up so that they can respond immediately, instead of working on taking their brand to the next level like Starbucks. I also took a look at the David’s Tea Facebook page and they will only respond back to one fan in a list of fan comments, which doesn’t even come close to the number that Starbucks receives on an hourly basis. It’s pretty hard to compare David’s Tea to Starbucks. Starbucks would need a full time staff around the clock to handle all the social media requests that come in. Right now, they only have two guys that manage their Twitter account from their headquarters in Seattle, making it more authentic and credible then having a bunch of interns respond to everything that comes in. These two guys have more knowledge of what exactly is going on within the company, and provide more valuable tweets then a team of 10 interns would. By and large, I think they do a great job by empowering their fans to speak up for them. The best marketing you can get is through word of mouth and it appears that Starbucks has that in the bag. I did not say they gave false information. I said they leave false information up. I gather you have never poked your nose into MSI. It’s a bloody mess 99.9% of the time. Trolls prevail.True customers are few. A snotty barista (from PA she is very free in sharing) is reigning right now, spewing false information in a very snooty matter. When anyone tries to correct it, they are sneered at. It’s horrible. I’ve seen their facebook page abandoned in the same manner: spam left up, questions unanswered for days and days. No, they don’t have to answer everything, but big issues should be addressed. And just leaving things unanswered for partners to answer is poor business. They are not partners on their computer. They are not on the job. Great that they are willing to answer. They should not need to. Starbucks has the money and resources to properly care for their social media and yet do not. Which makes one and more than one as I’ve had others tell me this as well that they simply do not care. Davids tea is still new and not that large-yet. But they have great customer service. In store and online. Like I said, Starbucks has huge resources to reply to customer complaints, yet responses either are never sent or take weeks to be sent (again, not just from my personal experience) or better yet, have false information because it has been outsourced and they have no knowledge whatsoever. Which causes even more complaints and confusion. i.e. recently a customer emailed Starbucks about the skinny mocha and asked if it was permanent. They were told no. It is in fact permanent. After a few more emails they said oops! Sorry, yes it is. Bad service. Starbucks chooses to have only two guy run their twitter account. They have the resources to do more. Saying a smaller company can afford to do what Starbucks cannot is absurd at best. It does not make it more authentic. It’s a cop out. Sorry. If you want that to be the case, then have that be their only job. With the resources they put into advertising, it could be done. You know what really annoys me? That I have to click ‘international’ on that page, and select UK. When I’m in a Starbucks, drinking my latte, I don’t consider myself to be an international customer. They’re on every street corner in London, just as anywhere else in the world. Why am I ostracised from the “Starbucks” Facebook page. I’d understand if it were the “Starbucks USA” page, but no. 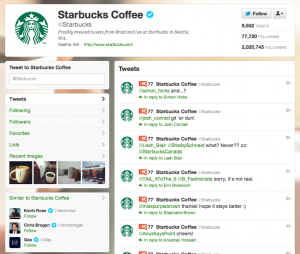 I think most brands can definitely take a page from Starbucks as a general Social Media best in class. While I feel they could do more outbound, I’m sure they are bogged down by the insane amounts of posts they respond to each day. I do like how they are empowered to help customers. I guess that’s much easier to do when you’re product is less than $5. While I don’t completely disagree with the comment above, I see where you’re coming from. However, try to put things in terms of scale. A more niche brand like David’s Tea doesn’t have the sheer volume of posts to deal with that Starbucks does. Not making excuses, just trying to put things in perspective. Maybe Starbucks needs to scale larger on the SM front. I developed the digital strategy for Gloria Jean’s Coffees, 38 countries over 1000 outlets and we struggled with scaleability of our efforts, I can only imagine how it is for the Starbucks team. They do a fantastic job of making engaging campaigns which are personal and fun. Replying to the mass of conversation flowing from their various platforms would be challenging. We tried to allow our individual locations to control their own communities with assistance from the corporate page and team with moderate success. I think the growth is impressive , however no company has effectively handled scale yet. This is the optimum use of FB and Twt. It takes a dedicated team to stay on top of this plan and most of all not to let it die. Too many programs start with great intentions and simply fade off into the sunset. Starbucks has not allowed this to happen. Great companies do not. Thanks for the article. New inspiration to do much of the same. lol you say that and the second thing I see on the facebook page is spam. Oh that’s right, that’s why I never go on there. Thanks for sharing! Starbucks do have a very good presence through social media. They have the resources and effective strategies to engage with consumers on a daily basis and create a personality people can relate to. Good to know, most times it very good for big companies to share their success stories so that wanna be if you like can emulate and learn a lot.